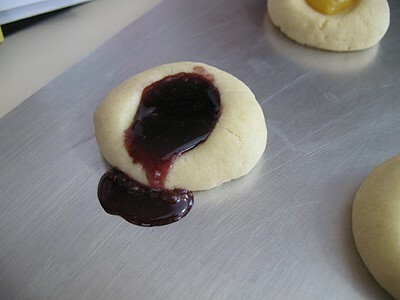 This thumbprint cookie recipe is probably one of the easiest cookies I’ve ever made. Throw all the ingredients together (all FIVE of them) and mix it all up. Refrigerate for an hour, roll them into balls, poke, bake, fill, bake. Done. Eat. When I was young, just married and before kids, I knew how to make a few things. Spaghetti, hamburgers, baked chicken and of course, chocolate chip cookies (as long as I had the instructions on the chocolate chip bag). That was about it. I relied very heavily on a cookbook my dad gave to me when I moved away from home for the first time. The Good Housekeeping Illustrated Cookbook . 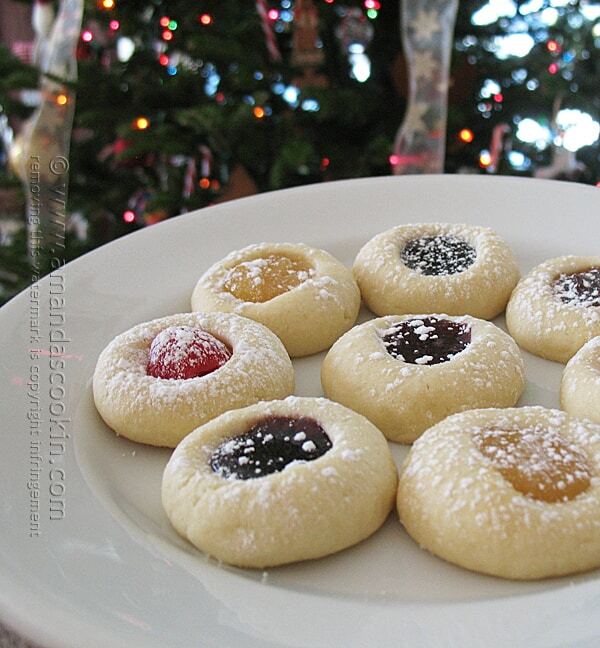 Well inside the pages of that lovingly tattered cookbook is a recipe for Spritz cookies. 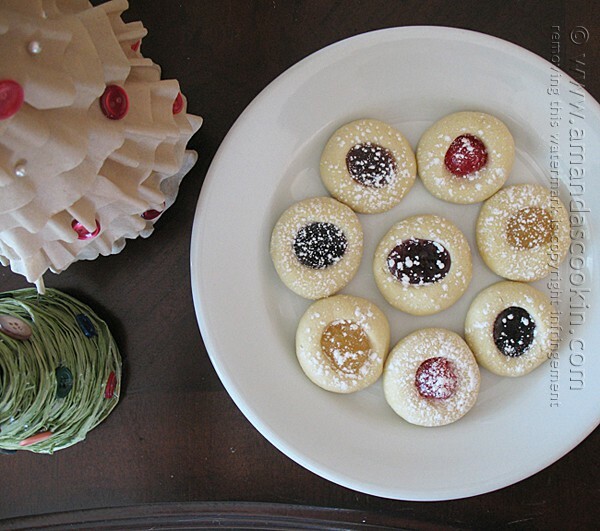 Then below that are instructions for using that same recipe to make raspberry thumbprints. 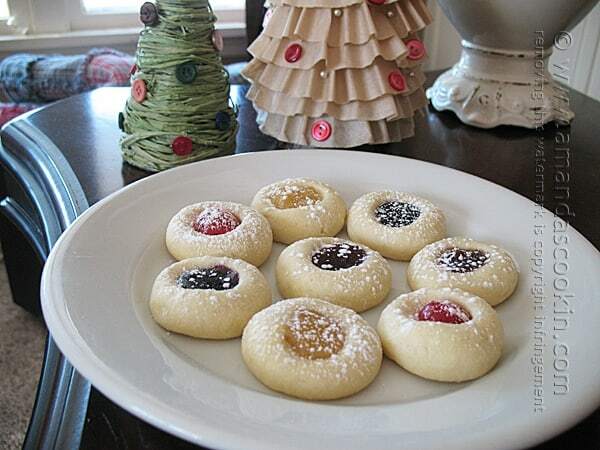 I’ve been making these thumbprint cookies, same recipe, no changes except the fillings, every Christmas for 24 years. I do have a few tips for this recipe. The recipe itself is rather short, but a bit longer with my added notes. This recipe makes 132 cookies! Use a TEASPOON to ensure uniform sizing. Measure out level teaspoons of dough (in order to get 132 cookies), otherwise, you can use a cookie scoop for larger cookies like I did here. 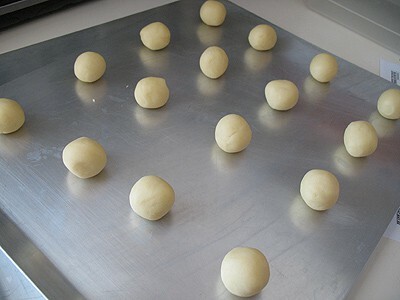 Roll balls in your hands to smooth, place on cookie sheet. 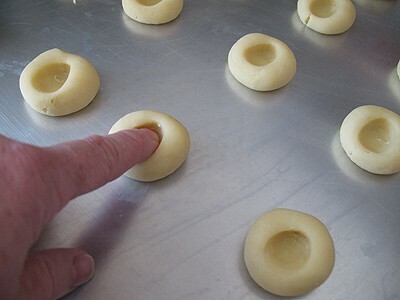 Use your thumb or pointing finger to gently press the center of the cookie, forming an indent. Since pressing the cookie will cause it to lean to one side, after creating all the indents, I turn the cookie sheet around and repress each indent from the other side. This makes then stand back upright. Bake for ten minutes. 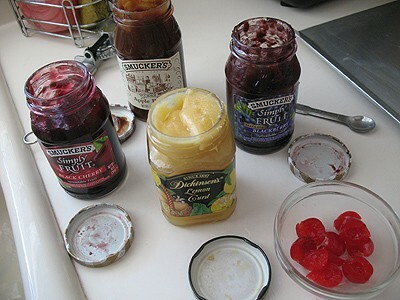 Remove from oven, fill indents with preserves, lemon or lime curd, marmalade, or even apple butter. Return to oven and bake 5-6 minutes more, do not let them get brown. Cool on racks. Sprinkle with powdered sugar if desired. If you followed my indenting tip above, you should have very little spillage… like this. You can watch the video on how to make these cookies below! 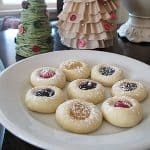 Thumbprint cookies are a soft, but firm cookie with a jam-filled center that are deliciously popular, especially during the holidays. Cream the butter and sugar, then add the egg, then slowly add the orange juice. Slowly add in the flour until combined. Wrap in plastic wrap and refrigerate for at least one hour. 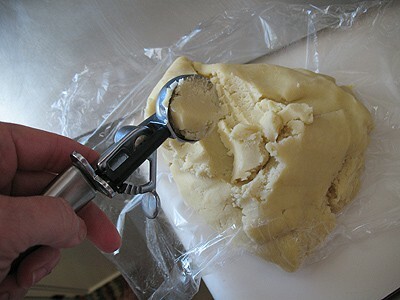 Measure out dough in level teaspoons to ensure uniform sizing. Since pressing the cookie will cause it to lean to one side, after creating all the indents, I turn the cookie sheet around and repress each indent from the other side. This makes then stand back upright. Bake for 10 minutes. 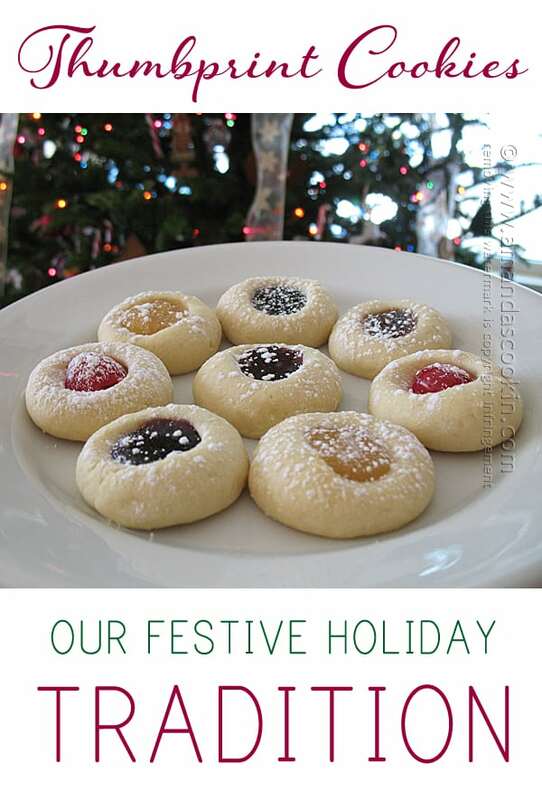 Please note that the photos in this recipe are for larger cookies where I used a cookie scoop. This will yield FAR less cookies. 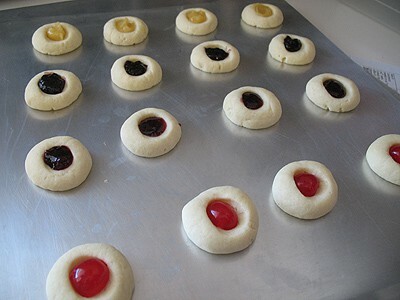 If you measure level teaspoons of dough, it should yield 132 cookies (11 dozen). 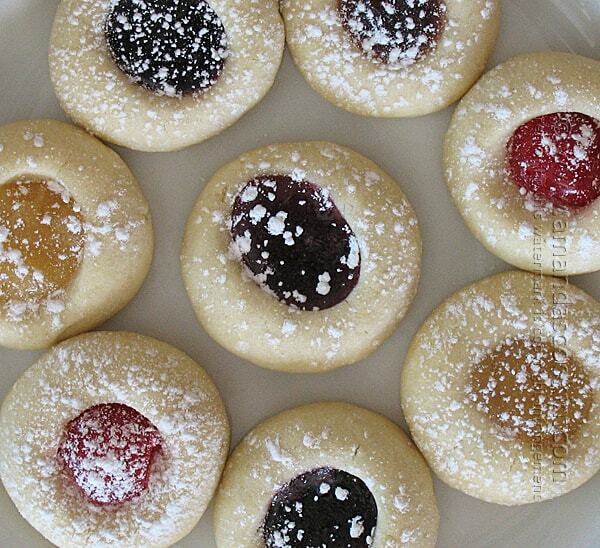 Calorie count does NOT include jam filling. If using curd do they need to be refrigerated? I just made these, but definitely could not cook them 10 minutes, then another 5 after the filling was put in, they got really brown..i used a small cookie scoop and got about 100 cookies, and i had to lower my oven temp down to 350, and then only leave them in 6 minutes, and then another 3 after putting on the fillings..but they do taste great.. thank you..
Glad they tasted great, sorry you had issues with the temp. I’m making them tomorrow!